Since 1991, Christopher M. McGuire has served as Vice-President of Programs and Director of the H.N. and Frances C. Berger Foundation. 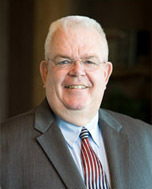 During his tenure with the Foundation, McGuire has played a leadership role in planning and implementing grant programs. He has been responsible for executive leadership, vision and oversight for a variety of programs and services, and has initiated the development of new philanthropic endeavors. As a leader and executive with more than 30 years of management experience, McGuire has launched strategic grant programs that have benefitted many recipients of the Foundation’s philanthropy. Throughout the years, as the Foundation has expanded its grant making projects, McGuire has contributed his expertise to successfully achieve the program goals. Prior to joining the H.N. and Frances C. Berger Foundation, McGuire was Owner and President of Arcadia Glass and Mirror Corporation for 16 years. He worked with Good Samaritan Hospital in Los Angeles for eight years in hospital administration and construction management. In addition, McGuire was an officer with the USN Civil Engineers Corp for three years. A dedicated community leader, McGuire has donated his time and expertise to many civic groups, including a tenure as past President of the Arcadia Chamber of Commerce, Arcadia Tournament of Roses, Arcadia Parks and Recreation Commission and the Arcadia 1984 Olympic Commission. He has also generously donated his time to the Santa Anita Little League, Arcadia High School Booster Club, and the California Hospital Engineers Association. McGuire attended the University of Arizona where he earned a Bachelor of Science degree in Mechanical Engineering. He also has a MBA from the University of Southern California. McGuire and his wife live in La Quinta and Arcadia. They have three adult children and nine grandchildren.